U.S. President Donald Trump speaks as U.N. Ambassador Nikki Haley looks on at the United Nations Global Call to Action on the World Drug Problem during the 73rd U.N. General Assembly in New York, Sept. 24, 2018. As he begins the sequel to his stormy U.N. debut, President Donald Trump will again confront the dangers posed by North Korea's nuclear threat, though its shadow may appear somewhat less ominous than a year ago. 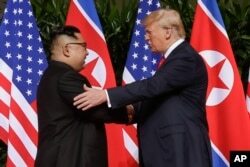 Twelve months after Trump stood at the rostrum of the U.N. General Assembly and derided North Korea's Kim Jong Un as "Rocket Man," the push to denuclearize the Korean Peninsula is a work in progress, although fears of war have given way to dreams of rapprochement. 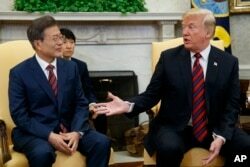 The president, whose bellicose denunciations of Pyongyang have largely given way to hopeful notes, plans to sit down with South Korean President Moon Jae-in, who comes bearing a personal message to Trump from North Korea's Kim after their inter-Korean talks last week. The nuclear threat was on the agenda at Trump's first meeting, a dinner with Japanese Prime Minister Shinzo Abe in Manhattan on Sunday night. FILE - President Donald Trump meets with Japanese Prime Minister Shinzo Abe in the Oval Office of the White House in Washington, June 7, 2018. 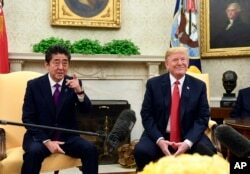 Abe stands first among world leaders in cultivating a close relationship with the president through displays of flattery that he has used to advance his efforts to influence the unpredictable American leader. FILE - U.S. 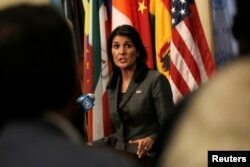 Ambassador to the United Nations Nikki Haley speaks to members of the media at U.N. headquarters in New York, Sept. 10, 2018. 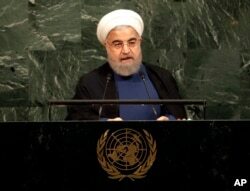 FILE - Iranian President Hassan Rouhani speaks during the United Nations General Assembly at U.N. headquarters, Sept. 20, 2017. "I think he's got a couple major possibilities really to help illuminate for the American people what America's place in the world,'' national security adviser John Bolton told Fox News Channel's Sunday Morning Futures, previewing Trump's U.N. appearance. What Happens at the UN General Assembly?